A good friend is one who suggests meeting up for coffee during the week and not only that she wants to meet at the bookstore. I met up with a dear friend tonight at a new Barnes & Noble. There was a lot of chatting, laughing and definitely a lot of book talk. We walked around the store for a bit pointing out books we liked (or didn’t) and petting the books we wanted to buy. I’m very fortunate in that my best friends know about my book passion (some of them share it) or at the very least don’t think I’m weird for loving books. Of course not everyone I know shares my love of books and over the years I’ve met a lot of people who’ll get that glazed-eye look once I start going on about a book or have flat out asked me “why do you read?” Like they can’t imagine why anyone would sit and read a book. I’m sure that’s happened to all of us bookworms at one point or another right? 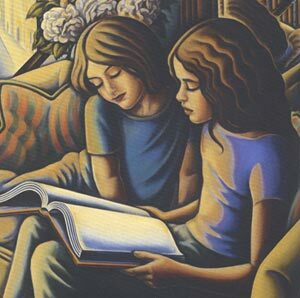 But do you have a good friend/friends who you can share your love of books with? Anyway I just wanted to tell my bookworm friends how much I enjoy spending time with them. Las quiero mucho! My best friend in college was (and still is) a fellow bookie. That’s the first time I experienced it and I miss it too! I am fortunate enough to know eight woman (including my mother and sister) who are also avid readers. These are the same people who give me book recommendations and who I lend my books to. My other non-bookish friends don’t have a clue what their missing! It’s often difficult to find people who are avid readers these days. Most people say they would love to, but there’s no time. It’s far easier for them to plonk down in front of the TV than pick up a book. BTW: Bookgirl, would you mind if I added your site to my blogroll ? My sister and I go to the bookstore on Friday nights to sit, read, and talk. So much fun! You are so lucky. My best book buddies are all from the internet. The only other “reader” in my life is my mother-in-law and she only ever goes to the library for her books! She doesn’t buy them! Gasp! Nik – Did you start laughing when your MIL said that? I mean, how does someone respond to that right? Stephanie – Oh you are lucky, 8 bookish friends! I agree non-bookish friends don’t have a clue what they are missing. Gavin – I’ve never understood the whole “I don’t have time” either. I mean, stay up late and read. ha,ha. Just kidding. And, sure, you can add me to your blogroll – thank you! Most of my really good friends are all readers to some extent. The nice thing about working in a library–most people sit in the break room at lunch with a book or magazine open before them and no one sees the lack of conversation as rude! I count myself very lucky that as well as the wonderful book friends I’ve made via the net, I also have many ‘real’ book friends. But you’re right to make the book and coffee house/tea room connection. I can’t think of anything nicer than meeting up with a good friend over a lunch or tea to talk books. My idea of absolute bliss! Why do you read? They ask you that? Because it is the same as breathing to me. I am so happy that my kids are really getting into to reading, finally. My mother is a book fiend, as is my niece. Bestest Friend Ever and Astrology Goddess are alos book fiends. DH has read maybe two books in 15 years. But, he does read lots of magazines and car things. I moved across the country in 2002 and away from all the bookish friends I had. My husband was the only other reader I knew and we spent a lot of time at the local Borders. In 2005 I met a woman who I instantly became bestest friends with and our most frequent activity is to have coffee and talk books. I am slowly meeting others in this area, but the majority of my book talk is online. Unfortunately, now I spend way too much time reading about reading instead of reading books! bookstore and a friend – now that is a good combination! I am lucky to have several close friends who love books – although I am not sure any compare to your love for books. That is a gift to those of us who know you …. I get the same look about photography from people at times. I think the looks come mainly from those who seem to not have a passion…. Your post is exactly why I started blogging, but at the time I never expected to find the great community of people that I have met. it has truly been a wonderful discovery. Every Monday night my best friend and I go to Borders. I got lucky and found a kindred soul; we share so many things, and one of them is a love for similar books. We have in-depth conversations about books we love, talk about our reading disappointments, etc. But the one thing we always do during our Monday night ritual is laugh. We have more fun in those hours then we do any other time. Really, I don’t know what I’d do without that time. Most of my friends love reading just as much as I do. I’m especially lucky that my husband loves to read, as well. And my mom is a voracious reader, as well. I’m keeping my fingers crossed for my 23-year-old daughter, however. Ann – Exactly – bliss! Nancy – I know, what’s up with these people right? 🙂 And, just think you’ll be sharing books with your kids. Very cool. Lisa – That is the drawback to book blogs isn’t it? I know I spend a lot of time talking about them too! Christine – You are sweetie! And, I know you completely understand. Sheri – It’s amazing how large the book blogging community has grown. It’s great. Finally people that understand! Chelle – That is too cool and what a great way to start off the week. I mean, Mondays can be well Mondays! I love hanging out in bookstores with friends! And I love that image you posted! Shadan – Yes, I think it has been about four years now. Wow. Love ya bunches girl! Lesley – You are right, I also get that glazed look I’m sure when people start talking about sports! I am lucky to have a few friends, too who are into reading. Just like me. Well, for those friends who don’t like to read as much as I do, we’ll just talk about other stuff. I don’t care what other people think about me and I am proud of being a bookworm! Haha! Josette – Power to the bookworms right? 🙂 That picture is from the book, “Where Books Fall Open,” by Bascove. Gorgeous pictures and poems celebrating reading, books, and libraries! I am fortunate to have 5 very close girlfriends that I went to both elementary and high school with, though few of them read. A couple read maybe 2 books a year, a couple none at all. However, I do have one friend who loves to read almost as much as I do and that is what our conversations center on a lot of the time. I feel it is really important for us all to have at least one person we can count on for a good book talk and I have found mine in Katie!